Australia’s largest apartment developer Meriton says its latest development “Ocean, Gold Coast” will transform the Surfers Paradise Beachfront. Rising 252 metres, Ocean will offer residents unobstructed, never-to-be built out views across the sea and beyond. Ocean is set to be a beachfront landmark, bringing to life a new era in modern living, one where lifestyle, convenience and luxury meet. On the doorstep of the Cypress Avenue light-rail station and just 20 minutes from Coolangatta Airport, Ocean will combine a vibrant lifestyle with modern amenities and easy connectivity, ensuring future residents will experience a quality of apartment living never before seen on the Gold Coast. The 74-floor glass tower designed in collaboration with award-winning architects SJB will feature 262 bespoke apartments and 446 luxury 5-star hotel suites. “We will be selling the high life, literally” Meriton founder and managing director Harry Triguboff said. The veteran developer recently announced apartment buyers would have the opportunity to buy from level 45 up to level 74. The lower floors would be devoted to hotel suites trading under Triguboff’s Meriton Suites brand. 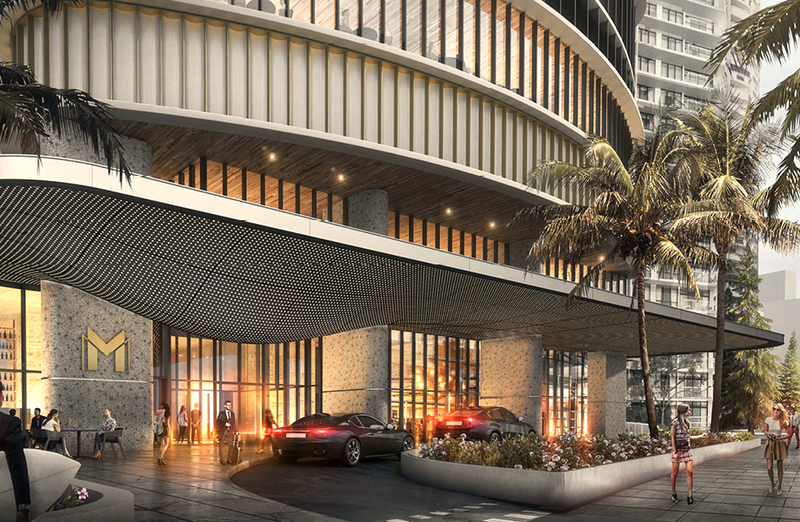 Ocean, which fronts premier beachfront street The Esplanade, will create a bold first impression from the moment residents and guests step into the expansive lobby with its soaring 4.5 metre ceilings. 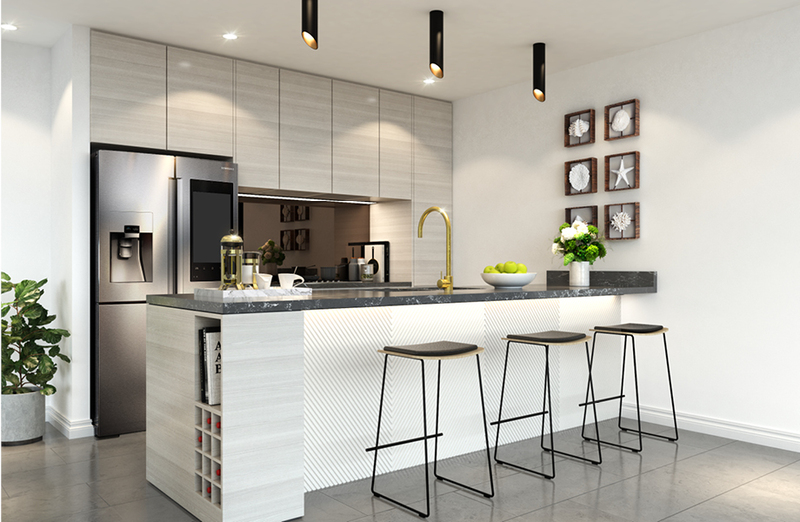 Residents will pass through this space to their own private reception area, absorbing the opulent atmosphere as they go, and enter a high-speed smart lift, ensuring a quick return to their apartments. The Ocean apartments will range from two-bedroom layouts with floor areas of up to 91sq m through to three-bedroom designs averaging 120sq m.
Ocean will also feature a rare collection of five top-floor penthouses that will have floor areas of up to 203 square metres. The hero of the home is undoubtedly the contemporary kitchen in each Ocean apartment. The sleek and luxurious design make it as functional as it is beautiful, with every detail considered. Features include premium SMEG stainless-steel appliances including concealed undermount rangehood, gas cooktop, oven, microwave, and a fully integrated dishwasher, Caesarstone benchtop and mirror splashback, contemporary pendant lights above all island benches add an extra element of sophistication. The tower will have three levels of basement and will sit on a five-level podium with extensive lifestyle facilities exclusive to Ocean residents and their guests complementing this stunning area. A beach club on level five is serviced by a bar and features lush landscaping, while level 33 features a 22-metre indoor pool with unobstructed ocean views, gymnasium, sauna and community rooms. The Ocean apartments will range from two-bedroom layouts with floor areas of up to 91sqm through to three-bedroom designs averaging 120sqm. Triguboff said Ocean, on which construction started in May on the 3833sq m site, would be one of his most iconic projects. “It will be my 19th tower on the Gold Coast and by far my most ambitious – you’re never too old to have ambition. “In my judgment it’s going to be an absolute winner. 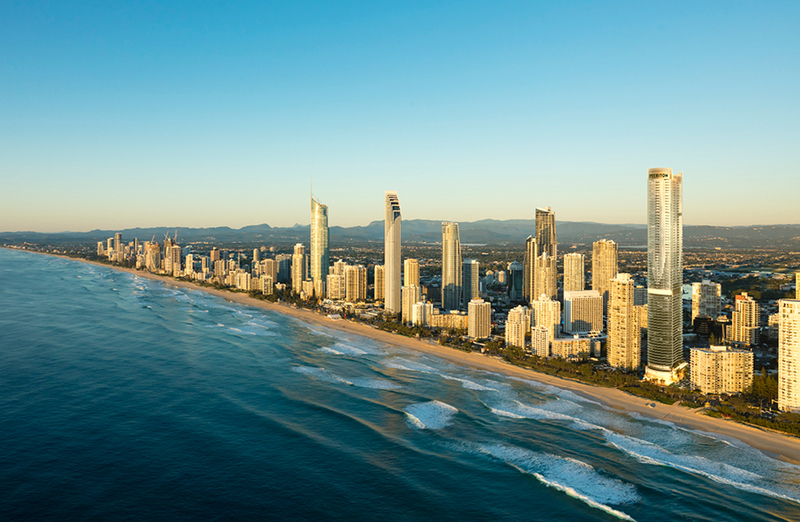 “There’s nothing like it on the Surfers Paradise beachfront – it’s got everything and every apartment will have unobstructed ocean or district views. Triguboff said he expected Ocean to have the Surfers Paradise beachfront market virtually to itself. “The banks have made it impossible for Australian developers to contemplate a beachfront project of any scale. No price has been put on the Ocean high life – prices are to be released ahead of the project’s launch next month. Construction is scheduled for completion in 2022. For information or to register your interest please click here. The Urban Developer is proud to partner with Meriton to deliver this article to you. In doing so, we can continue to publish our free daily news, information, insights and opinion to you, our valued readers.